Preface. Editorial Board for Volume 1. Applied mycology and biotechnology for agriculture and foods (G.G. Khachatourians, D.K. Arora). Filamentous fungi - growth and physiology (R.W.S. Weber, D. Pitt). Metabolic regulation in fungi (G.A. Marzluf). Protein secretion by fungi (J.F. Peberdy, G.L.F. Wallis, D.B. Archer). Significance of fungal peptide secondary metabolites in the agri-food industry (D.G. Panaccione, S.L. Annis). Plant antifungal peptides and their use in transgenic food crops (A.E. Woytowich, G.G. Khachatourians). Clustered metabolic pathway genes in filamentous fungi (J.W. Cary, P.-K. Chang, D. Bhatnagar). Molecular transformation, gene cloning, and gene expression systems for filamentous fungi (S.E. Gold, J.W. Duick, R.S. Redman, R.J. Rodriguez).Aspergillus nidulans as a model organism for the study of the expression of genes encoding enzymes of relevance in the food industry (A.P. MacCabe, M. Orejas, D. Ramán). Detection of food-borne toxigenic molds using molecular probes (M.E. Boysen, A.R.B. Eriksson, J. Schnürer). Strain improvement in filamentous fungi - an overview (K.M.H. Nevalainen). Fungal solid state fermentation - an overview (M.K. Gowthaman, C. Krishna, M. Moo-Young). Role of fungal enzymes in food processing (R.K. Saxena, R. Gupta, S. Saxena, R. Gulati). Production of organic acids and metabolites of fungi for food industry (N.A. Sahasrabudhe, N.V. Sankpal). Index of Authors. Keyword Index. Presenting a stimulating synthesis of rapidly growing research interests and publications by scholars in the field of applied mycology and biotechnology. The surge of research and development activity in applied mycology and fungal biotechnology relates to the need and utility of fungi in many contexts. These contexts are wide in scope, and include agriculture, animal and plant health, biotransformation of organic or inorganic matter, food safety, composition of nutrients and micronutrients, and human and animal infectious disease. 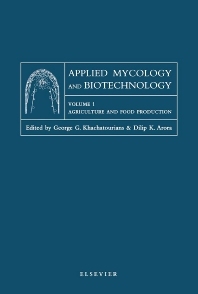 Containing a balanced treatment of principles, biotechnological manipulations and applications of major groups of fungi in agriculture and food, this book will serve as a practical resource for mycologists, microbiologists, biotechnologists, bioengineers, scientists from agri-food industry, biochemists, botanists and agriculturists.